On April 28th Gidget suffered a life-changing injury resulting from a devastating car accident. She was airlifted to Albany Medical where she spent weeks in the ICU following surgery. Unfortunately, she was diagnosed a C-4 quadriplegic with no use of her arms or legs. Since the accident she has made tremendous progress weaning herself off the ventilator and adapting to her new life in a wheelchair while still fighting to regain movement. Gidget returned home in October, 163 days after her accident. While this is a huge milestone in her recovery, we recognize that there is still a long road ahead. Her spirit remains intact but she and her husband Terry face a tremendous financial burden. There are many items that insurance will not cover and the costs are staggering. This includes home health care, physical and occupational therapy, medications, retrofitting the family home, purchasing a modified van and much more. Our hope is that these items will help her regain her independence and additional function in her arms. Many of you have asked if there is any way to help Gidget and Terry. We have finally found a solution. A fundraising campaign has been established in Gidget’s honor through HelpHOPELive. 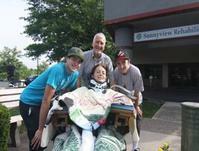 HelpHOPELive is a nonprofit that has been assisting the spinal cord injury community for over 30 years. Please consider helping Gidget realize her dream of an active life again by contributing to her fund raising campaign! All contributions are tax-deductible and administered for injury-related expenses only. All of you have helped carry her through this battle and given her the strength to fight. We thank you in advance for your generosity and support! And don’t forget to BELIEVE! Hi Gidget. I like your picturre on this page. We are looking forward to seeing you soon.